A book has been recently written by Daniel Loxton and Donald Prothero that seems to have to caused a bit of a stir amongst the skeptics. 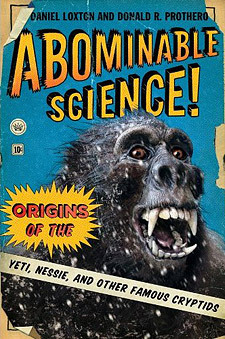 That book is called "Abominable Science!" and one reviewer has gone so far as to describe it as a "groundbreaking new book on the subject of cryptozoology". Groundbreaking? Does that mean it breaks new ground on the subject of my favourite cryptid, Nessie? Only one way to find out and that was to buy it (at the cheapest possible price, of course). Being numbered at 411 pages, it certainly carried weight gravitationally. Would it carry weight in the matter of cryptid critique? Now, I am only reviewing the specific chapter on the Loch Ness Monster as well as the general chapters on the science and culture of cryptozoology. The latter two would give an idea of the authors' generic approach to the Loch Ness Monster. I will not presume to judge them on the Sasquatch, Yeti, Sea Serpents or Mokele-Mbembe sections. The simple reason being I would not be able to tell how weighty their specific arguments would be. I may find these chapters entertaining, prosaical and historically informative, but that is not the main point ... how accurate are the arguments against the cryptid in question? But onto the Loch Ness Monster which occupies about 67 pages including notes. Now I have been interested in the Loch Ness Monster for nearly forty years and continue to believe there is a mystery to be solved in the loch. The question for me is where this mystery finds its true place between the overly simplistic view of excited tourists seeing boat wakes and the fantastical view of a resident colony of dinosaurs? Would this book prove to be ground breaking and offer new insights? The answer is a definite no. Loxton and Prothero play it safe by taking refuge in the over hyped theory of misidentification and hoax. Is there anything that could be called original and new in this chapter? Somewhat, but I will come back to that. But let us get over with the formalities first. Yes, we know there have been hoaxes. Yes, we know people can mistake everyday objects for monsters. And, yes, we know, no one has yet produced a specimen, dead or alive. Does that kill the story? Of course not. Indeed, it would have been better if they just stuck to their empirical mantra "show us the body", moved on and left the rest of us to get on with it. The problem here is that they won't and we end up with an inadequate explanation for what over a thousand people have claimed to have seen in the last 80 years and beyond. So, we know about the fake Surgeon's Photograph, Marmaduke Wetherell's Hippo tracks, the 1975 underwater tree stump and the other spurious inventions of men. These aside, the authors began to dig a hole for themselves in terms of accuracy. They first attempt to prove that any timeline of evidence before Nessie appeared in 1933 is fabrication. The matter of the dreaded water horse is rejected as irrelevant to Loch Ness and "none of them is indigenous to Loch Ness" anyway. This is just plain wrong. The imagery and folklore attached to those creatures is as much a cultural expression compared to the present day when we see all manner of strange representations of Nessie in film and other media. Do we doubt people claim to see things in Loch Ness just because a horror film depicts a green, seventy foot, man eating Nessie? Neither should it be the case with the Kelpie cultural representations two hundred years before. The authors' claim that no water horse was "indigenous to Loch Ness" is also wrong. There are multiple references to such a beast in the old literature. In fact, there is even a reference to such a story from 1852 a mere two pages on in their own chapter! An epic fail on the proof reading front? Furthermore, a monster hoax is mentioned from 1868, but it doesn't seem to occur to the author that a monster hoax in 1868 may presuppose a monster tradition in the loch pre-dating 1868. A major omission is also made at this point as this old article says that a "huge fish" attested to by only the "most credulous natives" was occasionally seen in the loch. What was this "huge fish" and why do the authors omit this reference? Note if it was only a sturgeon, I doubt anyone would be dismissing these dumb natives! I find this omission strange to say the least. "But the same cannot be said of a statement which I recently received from Mr. F. Fraser"
Gould then goes on to describe Mr. Fraser's sighting from 1904 and others from before 1933 also gain Gould's attention. It was clear to me that Gould's disinterest was towards second hand accounts as opposed to those with which he could interview the witness face to face. Basically, Gould has been misquoted in this tactic of promoting the weak evidence and ignoring the strong. And then we come to the story of St. Columba and his monster encounter. Keen to get rid of this most ancient of Loch Ness tales, the author basically rubbishes it as religious propaganda. I don't doubt the story is embellished, but Loxton and Prothero completely fail to explain why the story happened in of all places, Loch Ness. Coincidence? Some people may jump here and say it didn't happen in Loch Ness but in the River Ness. That's okay. Adamnan calls Loch Ness "the Lake of the River Ness". It was all the same river complex as far as he was concerned. Moving into the Nessie "era", it came as no surprise that old Alex Campbell comes in for a bit of a bashing. Campbell reported the first Nessie story involving the Mackays around March 1933. He is accused of hyping the story to further his monster agenda. Furthermore, the authors try to palm the whole thing off as two seals. I address these weak arguments in this article. Campbell is further accused of embellishing a reported sighting from 1930 involving three fishermen. However, Campbell is again vindicated by Gould who interviewed the witnesses who spoke of two or three shallow humps which were not seals! But since the authors footnote Gould's book, surely they would have known this? Is there anything novel in this chapter? There is one thing. It is the suggestion that the famous Spicers land sighting was a rehash of a scene from King Kong involving a Diplodocus chasing some men. Loxton and Prothero are somewhat ambiguous in deciding whether George Spicer lied about the whole thing or in some strange way "filtered" the scene through a view of an ordinary animal. How exactly does one do that (and how did he convince his wife to lie?). Loxton begins this King Kong theory with a very unscientific "I believe .." which suggests the evidence for his stance is not going to be strong and this is the case. Firstly, he selects a still from the Diplodocus scene that most resembles the Spicer drawing and redraws it accordingly. This makes one wonder what is wrong with the other stills? The answer is they do not support his theory. Both had long neck? Check. Both had no feet visible? Check. Both had tail curved round side of body? Check. Both had victim in mouth? Check. On closer examination, only a sycophantic skeptic would swallow this argument whole. The Spicer neck writhes and undulates, the Diplodocus one is rather stiff. Yes, both feet are not visible, but why is this "a striking detail"? And where exactly does a Diplodocus' feet begin? The tail is plainly seen not to curve elsewhere in the film and George Spicer cannot ultimately decide whether there was anything in a mouth or not. A bit of a mixed bag and not very convincing. Both Spicer and Gould had seen the Kong film, and various Nessie sceptics have flagged this film as an important influence in the perception of the Loch Ness Monster. Though one can understand how the dinosaurs in "King Kong" would make people think of the Loch Ness Monster, it is not clear how that translates to people allegedly mistaking birds for plesiosaurs on Loch Ness. Indeed, a look at the newspapers of the time does not exactly strongly link the two in the minds of the local, Scottish and British public. For starters, the only Kong you will see mentioned at the Highland newspapers archive is Hong Kong! Widening out, the nationally read Scotsman newspaper only mentions the film nine times to the end of 1934 but a review of the film in October 1933 does say the monsters of Loch Ness would feel quite a home on Skull Island! The more widely read London Times only mentions "King Kong" eight times in the same period and makes no linkage at all with the Loch Ness Monster. Not exactly compelling evidence. "Before Spicer's land sighting there were no long neck reports at all and it was the long neck that was so crucial." The problem here is a statistical one. There were in fact only two other reported sightings in 1933 before Spicer which were correctly stated as involving no long neck. But only about 10%-20% of sightings are known to involve a long neck which means our two sightings are not statistically significant. You would perhaps need at least 10 sightings on the record before you could attach any meaning to the long neck of the Spicers (note to myself - Ulrich Magin list claims 3 more reports - but not on my photocopies - double check). Going back to the photographic evidence, the authors seem to be selective in what they say about the first picture of the monster taken by a Hugh Gray in November 1933. The book says there is nothing to see in this picture but omit to mention the fish like head that can be seen to the right. They must surely have known about this as a google for "hugh gray loch ness" reveals an article at the top of page one which discusses this very thing. Or perhaps they only got their Nessie data from books published up to the 1970s? Again, it is what is not said rather than said that is significant here. Like Alex Campbell, the indirect approach of character assassination is chosen. Gray claimed six sightings and in a piece of flimsy guilt-by-association, Hugh Gray is lumped in with arch-hoaxer Frank Searle. Why? Because Searle also claimed multiple sightings! So, how often is someone allowed to see Nessie before they are branded a liar? Two, three, four? However, Loxton has not done his homework here. Consulting Dinsdale's book "Loch Ness Monster", it turns out these other sightings were only low grade wakes and bow waves. So, ermm, why didn't our liar Hugh jazz up his sightings a bit with humps and lomg necks? You can't win with skeptics. Gray is taken to task for holding onto the film for nearly three weeks. Yet if someone like Lachlan Stuart in 1951 has his picture processed the very same day, they also object with the accusation of fast profiteering. Speaking of Lachlan Stuart, this three hump photo was always an easy target for skeptics because the creature was in shallow waters. An easy spot to dump some hay bales according to a Richard Frere. Frere alleged that Stuart had owned up everything to him. However, the written record of what Frere said is contradictory and would not make it into a court of law as evidence. As it turns out, critics of the Stuart picture are quite accommodating to this contradiction ... a lot more than they would be to any flaw in an eyewitness account of a creature in Loch Ness! Regarding the Dinsdale film, the authors repeat the ongoing controversy about whether he only filmed a boat, but conclude the film's mysterious blob cannot tell us for sure whether it was a monster. Rather, Tim's observational skills are called into question because he had two false alarms before then but it is a fact that his own self-judgement rejected them! On this basis, a head-neck sighting by Tim 11 years later is also called into question. But surely after eleven years of subsequent loch observation, Dinsdale would have been one of the most experienced observers of the loch and conversant with almost every deceptive appearance the loch presents? Furthermore, the ad hominem implication that Dinsdale was not a fit witness because he believed in the supernatural/paranormal does the authors no credit at all. Finally, the alleged issue of the Dinsdale family not publishing the film in order to allegedly hide the "truth" is also now a non-issue. They put the whole film on the web this year. The authors also look at other ventures such as expeditions and sonar. The 1972 flipper is correctly shown to be "over-enhanced" but I must admit that having seen that picture, I can still see a similar flipper shape in the unenhanced picture! Pareidolia or something else? Surface watch expeditions such as the LNI from 1962-1972 are discussed and the authors compute that quality evidence should have been obtained. Unfortunately, they again indulge in selective quoting when they quote Roy Mackal in his book "Monsters of Loch Ness" where he says there are about 3,000 recorded sightings in a 30 year period since 1933. However, they then completely ignore what Mackal says on the next page of his book when he reduces that number to 10 valid sightings per year (a number I agree with but for different reasons). Why did they not use this number instead? Because 100 sightings per year bolsters their argument better than 10! The sonar evidence is dismissed on the basis that false positives from reflection and refraction can mislead. Which leads me to ask whether the authors consider sonar a viable instrument given these limitations? Sadly, the three mysterious sonar hits from Operation Deepscan in 1987 are dismissed as "wobbly scratches". On the other hand, Loch Ness researcher, Adrian Shine, says he cannot explain them (though that does not mean he admits they are monsters). Misqouting is also evident when the authors state that work by Adrian Shine found only 22 tonnes of fish in the loch. This is not true either, his sonar work only refers to the open pelagic area of the loch which omits the littoral and abyssal regions. That would exclude the bulk of shore hugging fish such as migratory salmon and trout and the deeper fish such as eels. So the authors plump for the misidentification of everyday objects and hoaxes as the reason we have the Loch Ness Monster. What can we say about this? The first thing that came to mind was the author's own plea for scientific testability in chapter one. When you bring anecdotal evidence to this theory, how is it testable? Or to be more accurate, how is this theory falsifiable? What theoretical eyewitness case would falsify this theory? None it would appear because the theory is a classic example of circular reasoning. To wit, "if it is not misidentification it is a hoax" and "if it is not a hoax it is misidentification". This theory would appear to be about as useful as a chocolate teapot in evaluating eyewitness testimony. The diversity of descriptions of the creature is not a game changer either. It is readily admitted that a proportion of stories are hoaxes and misidentifications. This is inevitably going to corrupt any attempt to form a picture of what any creature may look like. Faulty perception and memory are also said to play a big part in what people claim to see in Loch Ness. That is a pretty generalised statement. It would be more accurate to say the reliability of a sighting is proportional to the experience of the observer, the distance to the object, the time spent observing it, the clarity of the scene and the time elapsed since the event in relating it. But this book seems intent on whitewashing every witness with the same brush. We have witnesses who have claimed to have seen the creature close up and we have witnesses experienced with the loch's conditions. But you know why these are not a problem? Because we just shunt them in a non-falsifiable way into the "hoax" section! The discussion on memory distortion is over-stated and like real-time misperception, is not very well cross-referenced in the book's footnotes (i.e. next to no research has been done to prove any of this in a cryptid context). In fact, shall we say that much of the evidence is ... anecdotal! Many sightings are recorded within days by the newspapers or by on site investigators. If you are talking about years and begin to ask detailed questions about time of day or weather conditions then you will get some degree of error. But put it this way, if you saw a ten foot hump rear itself out of the water only 200 metres from you, how burnt into the memory would that be? It is a well established fact that traumatic events are more easily imprinted on the memory. That fact does not seem to be factored into our authors' thinking. So where does this all leave us? A lot of misquotes, faulty reasoning and weak assumptions. Do the authors offer anything valid in their defence. They do. The lack of a live or dead specimen is the strongest argument. I don't necessarily accept their argument about finding bones. If the Loch Ness Monster was a fish like animal, its cartilaginous bones would dissolve in the waters quicker. That is why advocates of the Sturgeon theory are less likely to find a dead specimen at the bottom of the loch. The bottom of the loch is also about 12 square miles in extent and barely explored. Furthermore, the bottom is in a continual state of silting up which perhaps progresses at about a rate of one millimetre per year. The loch's chemical nature also ensures decomposition progresses at a slower rate allowing scavengers (and other Nessies?) to strip a body before it bloats and becomes buoyant. Nevertheless, it is the strongest argument against large creatures in Loch Ness. The point about the infrequency of sightings is also explained if the creature is not the plesiosaur type that is so often set up as a straw man argument, but a primary water breather. What that might be is a matter of speculation. Finally, the matter is raised about Nessie-type fossils or rather the lack of them in the surrounding region. I confess I could not point you to one, primarily because I do not know what species the creature belongs to. If I had an idea of that, I would begin to look at the fossil record. Until then, I do not have the information to make an informed opinion. But the question has started a train of thought. So, going back to the beginning. Something that lies between boat wakes and a colony of dinosaurs. Like the dark abyss of Loch Ness that lies between surface and bottom, no one seems to want to explore that region much!